*He was 44 when they met.….She was 19. They played opposite each other in “To Have & Have Not” in 1943 and in the beginning she was terrified. She kept her head down low to keep her mouth from trembling. Bogie was patient and helped her enormously. They immediately hit it off. . He called Bacall “baby” and she looked on Bogart as a mentor and a teacher throughout their life together. The problem was he was married at the time to actress Mayo Methot (his third marriage). They called Mayo and Bogie the “Battling Bogarts” as their fights were legendary. Bogie and Mayo drank and fought together. *Bogie had been a popular actor at Warner Bros known for his “tough guy” image and gangster roles. He got his big break in film from actor Leslie Howard in the 1936 film adaptation of the popular stage play, “The Petrified Forest”. His role as gangster Duke Mantee.on Broadway had brought him acclaim, and Leslie Howard dug his heels in and refused to do the film without Bogart in the role of Mantee. Bogie never forgot and named his daughter Leslie after his friend, Leslie Howard. *Bogart was not the original Gerber baby model, but he was the model for Mellin’s baby food ads at the turn of the century. His mother, Maud, a renowned illustrator, used him to sketch the ads. He was born into wealth, his father was a prominent doctor in New York who made around 20,000 a year, yet Maud made more from her illustrations-$50,000 yearly, an enormous sum for the time. 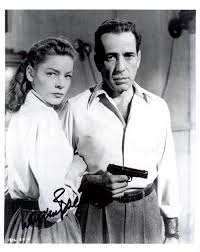 *Bogart was known for his battles with studio boss Jack Warner. It was the heyday of the studio system and Bogie, as he was known to friends, would boast that he always had some, what he called, “F.U” money tucked away (he actually used a far more colorful phrase!). The studios would periodically lend the actors out to other studios as part of a deal that was struck between the two companies, with or without the consent of the star in question. But Bogie often objected, and would be prepared to walk away. Hence, he needed his “F.U” money as leverage! *Bogart was one of the founders and reigning members of the original “Rat Pack”, an exclusive club that met for lunch and cocktails and witty repartee. Bogie, along with wife Lauren Bacall, Judy Garland, David Niven, Katherine Hepburn, and Spencer Tracy were all members. Frank Sinatra and Judy Garland continued the club in Hollywood that later included Dean Martin and Sammy Davis Jr.
Key Largo is part of the continuing Summer Film Series at Tampa Theatre. Next Sunday, Caddyshack is showing at 3:00 pm.